in conjunction with other frameworks. In the coming weeks, APQC will be releasing a case study on a pharmaceutical company is using the PCF, as well as a document that expands on the PCF usage themes. 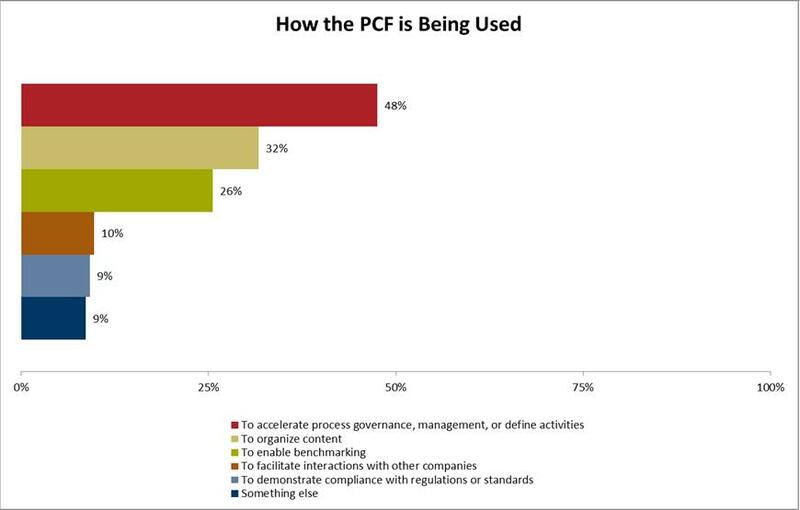 We are always looking for more input, so leave a comment and tell us how you are using the PCF. Thank you for taking the time to read our post and respond. You are using the PCF exactly as intended. If you haven't looked at it, I would suggest you look at our industry specific PCF's, as they might help as you start down the road of process management. In the coming weeks will have three research articles that will build upon this post. Stay tuned. Thanks for your comments and questions. I am glad to hear you like the framework and that it is working out well for you. In regards your question, I think I would point you to our Process Definitions and Key Measures. The documents in this collection contain detailed definitions and key measures for the processes outlined in the PCF. Hi Jonathan, Good note. It was very clear. Is there a new document with more information about PCF usage themes? Thanks, Adrian. Thank you for your note, and I am glad you liked our post. We have put some additional information in the following Knowledge Base article. Hello Mr. Tehrani, thank you for your inquiry. Yes, the names of the process elements are the same between the two processes "Measure customer satisfaction with customer requests/inquiries handling" (10401) and "Measure customer satisfaction with products and services" (10403). The real issue here is that there should not be two processes in the PCF where the only difference is the feedstock (in this case, one processes customer requests/inquiries while the other is products and services). If the same activities can handle a wide variety of feedstocks, then those activities don't need to be recreated to support the various inputs to the process. I'll make a notation on our issue tracker for this.